Think you know your Old Testament trivia well? 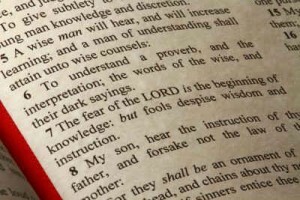 I am certain there are more obscure questions and answers that can be found in the pages of the 39 books of the Old Testament, but here are 20 Bible trivia questions to start your thinking. Most of them are serious, but I hope you enjoy the three humorous ones at the end of the quiz. The oldest man in the Bible, Methuselah died before his father. How could that be? 1. Who wrote the words on the tables of stone for the 10 Commandments? 2. Elijah went to Heaven in a …? 3. Who was Samson’s wife? 4. In Genesis 4 a musician is named. Who was he? 5. Who was cremated in Jabeshgilead in 1 Samuel? 6. King Saul consulted a witch to communicate with which Old Testament prophet? 7. God told Abraham that his children would be as numerous as what two things? 8. What did Jonathan eat not knowing that his father had forbidden his soldiers to eat the rest of the day? 9. The oldest man in the Bible, Methuselah died before his father. How could that be? 10. The word “hats” is only found once in the King James Version of the Bible. In which well-known story does it appear? 11. Besides leaving the presence of the Lord and living in the land of Nod, what was Cain’s punishment for killing Abel? 12. Ravens brought food to which Old Testament prophet? 13. What does Beth-El (or Bethel) in Genesis 28 mean? 14. Who was Cain’s first son? 15. Which prophet saw God give life to a pile of dry bones? 16. Who turned into a pillar of salt in the book of Genesis? 17. Leviathan is described in Job 41. What comes from his mouth and nostrils? Here are some of my favorite funny Old Testament trivia questions and answers. 18. Besides Adam and Eve, who in the Old Testament didn’t have parents? 19. Who was the shortest man in the Bible? 20. What is the first sport mentioned in the Bible? 3. A woman of Timnath, Judges 14. The Bible never says that Samson was married to Delilah. Judges 16. 10. Story of Shadrach, Meshach and Abednego when they were put in the fiery furnace. Daniel 3:21. Do you have any Old Testament trivia you would like to share. I am particularly interested in seeing other humorous questions and answers (I love puns) or trivia questions that people often get wrong. Please leave a comment below with your Old Testament trivia. I have always wanted to know when Jesus said it`s easier for a Camel to pass through the eye of a needle than a rich man to enter heaven. I have found the answer to that one that the needle was an opening in the wall surrounding the city when the gates where shut,and the rich man would have a lot of trouble getting his camel through this hole in the wall. I want to thank you for a brain workout, I think I got about 10 right, which is still lacking. Now, thanks in part to you, I need to reread some of what I’ve read in the past, and believe it or not, I thoroughly enjoy reading the old testament. There are so many stories, yes some that are too risque for little eyes and ears, there is murder, mayhem, infidelity, wars, famine, wild women, nice women, great men and less than ideal men. In other words, a complete cornucopia of human existence, of the life and times of those of us made in His image!! I hope you do more of these little quizzes, this was fun, not to mention the fact that this is a good warmup for Thursday night 8 pm, on GSN, The American Bible Challenge! It`s been quite some time since i posted this question, about who was the man that that if he could find ten just men in this city God would not destroy it. Thanks Lorri for the answers,but Gomorrah,and Lot came into the answer,and Lots wife looked back and was turned into a pillar of salt. That`s how i am confused. God did not mention Gomorrah until Lot came into the story,and God destroyed both cities. I love this… It motivates me to study the again and again. How do we know that we will be drinking tea and not coffee in heaven? hi dudes i was doing this thing in class it was printed out and teach told us to find the answers on the internet and we did!!!! i have some bible quiz but this is just for fun 😀 DON’T TAKE IT TOO SERIOUS ..
WHO IS THE SMALLEST MAN IN BIBLE? WHO IS THE STRONGEST MAN IN BIBLE? WHO IS THE SPY IN BIBLE? WHO COOKS GOOD IN BIBLE? WHAT BIBLE CHAPTER GRANTED OUR WISH? Here is one of the funny trivia question in the Old Testament. What is the 2nd famous sport mentioned in the old testament? What was the first epistle? Paul writes the first of his 14 New Testament letters (I Thessalonians) to the church at Thessalonica from Corinth during his second missionary journey, around AD 52. This is believed to be the first epistle or letter in the New Testament. Next post: When God is Silent: Why Does God Not Seem To Be Answering My Prayer?